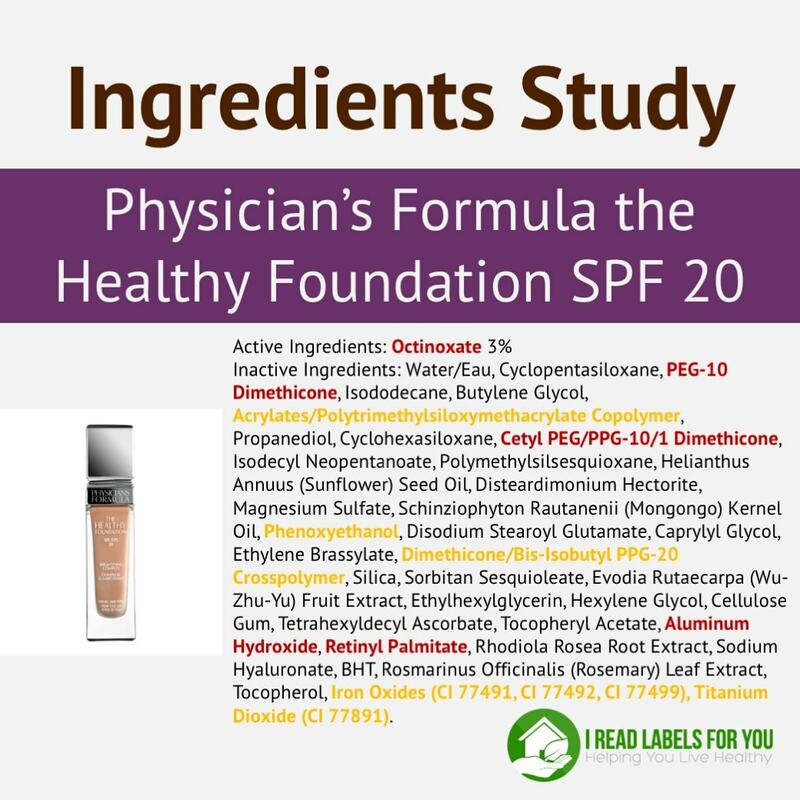 Many of you asked me about Physicians Formula foundations so today we will take a look at the ingredients of the Physicians Formula foundation called the Healthy Foundation with SPF 20. The ingredients’ list is long, but don’t worry. I will make it easy for you and walk you through my process of gauging whether a cosmetic product is safe to use so you can apply my process, too! First of all, I always look at the bottom of the ingredient list to see what type of colorants are used. I prefer mineral colorants over synthetic (petroleum-based) colorants because they won’t have contaminants that come from crude petroleum such as carcinogenic and endocrine disrupting PAHs (Polycyclic Aromatic Hydrocarbons), as detailed by the FDA. The good news is that Physicians Formula foundation uses mineral pigments, and you can see them at the bottom of the list with the CI prefixes followed by numbers. The bad news is that all colorants, including mineral ones, may contain the trace amount of heavy metals such as lead, cadmium, arsenic, mercury, etc. The FDA specifies limits for only 3 heavy metals for each colorant (in Europe, they have a longer list of heavy metals); however, in the absence of third-party testing to make sure that these three heavy metals are within the FDA’s limits, we consumers have to rely on what companies tell us. 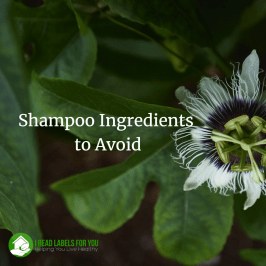 To make matters worse, manufacturers typically just rely on what their colorant suppliers tell them; they don’t independently test each batch, which would admittedly be prohibitively expensive. In this situation, when we do not have third-party testing, I feel more assured when colorants are NOT made in China. There, the background levels of environmental pollution are so high that, in my opinion, there is a higher risk of heavy metal contamination of whatever is manufactured there. Moreover, Chinese environmental and manufacturing regulations are not as strict as, let’s say, European ones. Thus, I always contact a cosmetic company and ask what country their mineral pigments are manufactured in. I contacted the manufacturer of the Physicians Formula foundation on March 9, 2018, and on March 15, I received the following response to my question as to whether their pigments are made in China. As you can see they did not respond to my specific question. This is similar to responses I received from other cosmetic companies, which make me suspicious that there is a possibility that their mineral pigments are made in China. Of course, I don’t know this to be a fact. What do you think? Leave a comment and let us know. Anyway, I prefer to use mineral cosmetics of companies whose mineral pigments are NOT manufactured in China, and whose manufacturers are transparent about this fact. Here is a full list of ingredients that I accessed here on April 2, 2018. Because this is a foundation with SPF, the manufacturer is required by law to list UV filters as active ingredients. In this case, it is Octinoxate. First of all, it is important to note here that Octinoxate protects ONLY from UVB rays, not from UVA. UVA radiation does not burn the skin like UVB does. It is sneaky because you can receive dangerous levels of UVA without knowing it. Also, UVA protection is NOT linked to the SPF value. In other words, SPF value simply shows how much time you can spend in the sun without burning your skin. Thus, if your skin normally burns after 15 minutes in the sun with the Physicians Formula foundation on you can probably spend 15 minutes multiplied by 20, which is 300 minutes or 5 hours in the sun without burning your skin. But again, we do not know how you will be affected by UVA radiation, which is very dangerous. Please visit the Skin Cancer Foundation for more information on this topic. In addition to the fact that Octinoxate is not good at protecting us from UVA radiation, studies show that it penetrates the skin and has been found in mother’s milk. Studies have shown that it may have some weak hormone-mimicking effects. More studies are needed to determine its long-term health effects on humans (read more here and here). In conclusion, I try to stay away from chemical sunscreens and prefer to use mineral UV filters, such as zinc oxide and titanium dioxide. They protect from both UVB and UVA radiation, and they are found to be the safest sunscreens. For more information on specific facial mineral sunscreens that I recommend, please read here. After reading ingredients of various consumer products over the course of 5 years or so, in a way, I have become a scanning machine. I can look at a long list of ingredient and spot from memory the ingredients of higher concern. So from scanning the Physician Formula foundation ingredients, I would like to discuss three ingredients that I find most concerning. Retinyl Palmitate: is vitamin A carried in palmitic acid. While it is a good ingredient to have in your night cream, I do not recommend using it during the day when you are exposed to the sun. Animal studies have shown that retinyl palmitate speeds up the photo-carcinogenic effects of the sun and the development of skin tumors and lesions. (source). Note that I do not know if there is 1,4-dioxane in the Physician’s Formula foundation, but want to educate you about the potential. The EPA (U.S. Environmental Protection Agency) has classified 1,4-dioxane as “likely to be carcinogenic to humans.” FDA studies have demonstrated that 1,4-dioxane can be absorbed by human skin, meaning that it can circulate through the body after being absorbed through the skin. There is a process called 1,4-dioxane vacuum-stripping that can reduce or even remove this contaminant from a product. Unfortunately, independent tests found that many manufacturers fail to do so. 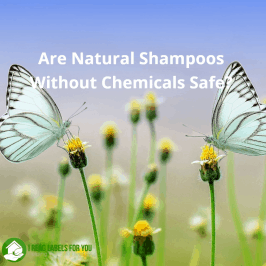 Thus, we consumers do not know if there is any 1,4-dioxane left in a product. To be fair, I have not posted this question to the Physicians Formula’s customer service. So if you, Physicians Formula, read this, please let me know how you make sure that there is no 1,4-dioxane left in your products. Aluminum Hydroxide: is a form of aluminum. Studies show that aluminum can penetrate the skin. Aluminum is a heavy metal that can accumulate in the body, contributing to what scientists call “body burden” and potentially increasing the risk of health problems (source). In addition, there is some evidence that aluminum in sunscreens may increase the risk of the oxidative damage in the skin (source). The way the law governing ingredients in cosmetic products works is that ingredients are used first and safety studies are done later. As a result, many cosmetic products contain ingredients that have limited health and environmental data or no safety data at all. For example, I was unable to find any safety data for two ingredients, Acrylates/Polytrimethylsiloxymethacrylate Copolymer and Dimethicone/Bis-Isobutyl PPG-20 Crosspolymer, used in the Physicians Formula foundation. By looking at their names, they seem to be related to silicone polymers, which are used to create a gliding texture of the foundation and a dewy effect. In fact, I see 7 ingredients in the Physicians Formula foundation that have silicone components in the chemical structure. There is an ongoing discussion of about their fate in the environment. For this reason, I use them only when it is absolutely necessary. I have done a lot of research into them (read about them here and here) and I am only comfortable with using dimethicone. Let me tell you a few words about a preservative used in the Physician’s Formula foundation, which is phenoxyethanol. 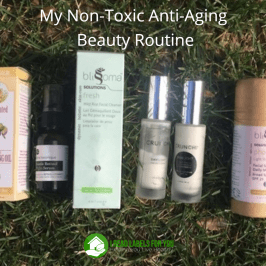 While it is far from the worst preservative used in skin care and personal care products, there are also much better ones. In fact, I found a correlation between preservatives used in a product and overall safety of the product. I call the products with phenoxyethanol “the middle of the road” products. The good news is that it is NOT linked to cancer or endocrine disruption. However, it is made by reacting highly corrosive phenol with carcinogenic ethylene oxide. As a result, it may contain residue amounts of both. The American Society of Contact Dermatitis lists phenoxyethanol as one of the core allergens even in concentrations as low as 1%. 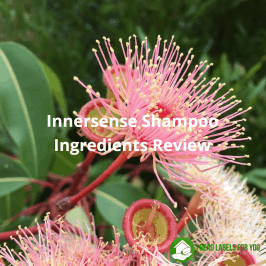 In conclusion, I believe it is not the worst product I have seen; however, in my opinion, I believe it is not good enough for me to recommend it for you. I would not use it on my skin either. And lastly, please know that the best sunscreen is to wear a hat and limit the time you spend in the sun. Let me know what you think. Was this information helpful? How can I help you better gauge the safety of a product you are considering using? To learn about a liquid foundation I chose to use, please click here. Thank you for all your information. You’re a wealth of knowledge. Have you heard of Adama minerals and wondered if you’ve ever analyzed their ingredients. I’m new to your site and love it! Thank you SOooo VERY MUCH Irina for taking the time to educate us about the negatives and potential harm of Physicians Formula. I appreciate it so very much! While I am NOT that educated about ingredients, after looking at the list I did recognize some concerns and you have clarified them. I have been using Pacifica and Mineral Fusion and yet with your warnings I am looking closer at the labels and I just can’t find hardly ANY companies that don’t use chemicals like the Titanium Dioxide even in their loose powders of course. I took a look at some of that research as well. So, THANK YOU SO MUCH FOR THIS WARNING about the loose powder hazards; “Titanium Dioxide: I know that some of you heard that titanium dioxide is linked to cancer. Please know that it is linked to cancer only when it is inhaled in loose powdered form.” I am glad to know that it is just the “loose powder” formulations that have an issue. My, I can’t find any loose translucent powder though without it except for the Crunchi Company (well, I saw a couple of other Companies, but then they were even more expensive like $75 for powder and Crunchi’s is only $34 and it probably will last a long time) that you have recommended, so I will purchase it from them. Although the higher end truly healthy makeup lines are so pricey but to protect our Health (and therefore Physical Beauty) is imperative. Thank you so much for the information. I have decided to stop using physicians formula based on all the potentially harmul ingredients, especially aluminum. Alluminum is the reason I went to a more natural deodorant. What do you think about Burts Bees? They are more of a reasonably priced makeup that claim to be 99-100% natural. I love their lip products and was considering using their face makeup. Thank you!